Objective Continuous renal replacement therapy (CRRT) is extremely challenging in very small children, as most CRRT intravascular access devices are too large. We aimed to quantify flow rates through several alternative intravascular devices. Design Experimental in vitro study simulating CRRT. Setting Whole milk and equine blood were used as human blood substitutes due to similar viscosity. Milk under gravity pressure was run through a standard CRRT circuit. Equine blood was run through a working CRRT machine. Subjects Eight intravenous access devices used in paediatrics, with a variety of connectors. Interventions Devices were tested with milk for flow between 50 and 200 mm Hg pressure, and with blood for pressure at flows between 20 and 50 mL/min. Main outcome measures Flows at each input pressure with milk, and pressures at each flow rate with blood. Results With both experimental systems, 8Fr and 6.5Fr haemodialysis catheters, and 18G and 20G cannulae allowed excellent low pressure flow rates. 5Fr triple central catheter, 5Fr and 4Fr umbilical venous catheter, and 5Fr haemodialysis catheters did not allow flows at reasonable pressures for CRRT. A three-way tap did not impede flows, but a needle-free valve did. Flows increased with pressure non-linearly, presumably due to increasing turbulence. Conclusions In very small patients needing CRRT, where large haemodialysis catheters cannot be used due to the patient size, we advise the use of two 18G cannulae in different sites. A three-way tap can be added, but not any other connectors. In vitro this system gave suitable flow rates with some flexibility for in vivo variations. Continuous renal replacement therapy is technically difficult in very small infants. Intravenous access devices which allow suitable flows are generally too long for such children. Continuous renal replacement therapy (CRRT) is commonly used in critical care areas, with children requiring renal support as a result of complications of severe diseases such as sepsis with multiorgan failure.1 The majority of CRRT devices are rated at a minimum weight of 8 kg, and are designed with corresponding intravenous access devices for children of this size, both by diameter and by length. In recent years, however, due to factors such as increased prematurity survival and a consequential increase in acute renal failure, and early recognition of metabolic conditions, there has been an increased demand for CRRT in children below this minimum weight.2 Due to the considerably smaller size of these children, the standard intravascular access devices are often incompatible and alternative systems have to be created from standard intravascular access devices, while constrained by having to achieve a clinically useful minimum flow rate of 30 mL/min. Following our experience of a technically successful haemofiltration of a 1.6 kg child, we decided to investigate this further. According to the Hagen-Poiseuille's equation, the flow rate of a liquid is directly proportional to the pressure, the fourth power of the radius, and inversely proportional to the length and viscosity.3 This can be assumed for all Newtonian fluids exhibiting laminar flow. In the real world, however, flow is usually non-laminar and any increase in pressure or length or decrease in radius can result in an increase in turbulent flow. Medical devices are also not perfect straight tubes, making Hagen-Poiseuille's equation not directly applicable. It is therefore important to investigate the impact of increased length and pressure, and a decrease in radius on the flow rates through different devices. The aim of this study was to investigate flow rates through a variety of intravenous access devices, at a variety of pressures, in order to investigate alternative methods of intravascular access for CRRT for very small children. The investigation was carried out in two phases. the first using a blood substitute to investigate flow rates through a variety of intravenous devices using gravity to generate fixed pressure intervals. The second involved the use of equine blood to allow our initial findings to be tested with the CRRT machines. For both phases, the same eight commonly available intravenous devices were used. The devices were tested on their own and in combination with needle-free valves and three-way taps. Both lumens of the 8Fr, 6.5Fr and 5Fr haemodialysis catheters and the distal lumen of the 5Fr central line were used. A CRRT circuit line of standard length was used in all systems. Whole milk at room temperature was used as a blood substitute, due to its similar viscosity. Blood has a viscosity of between 0.03 and 0.04 gcm−1s−1 depending on haematocrit, and whole milk has a viscosity of 0.03 gcm−1s−1.4 A 1 L saline bag was drained, replaced with whole milk and suspended at four different heights, creating four different pressures of 50, 100, 150 and 200 mm Hg, correlating to a height of 68, 136, 204 and 272 cm of milk pressure. The height was set between the meniscus of the liquid and the lumen of the intravascular device. A bowl was placed on a set of scales and positioned underneath the apparatus to collect the liquid. In order to quantify, the flow each system was run for 3 min and the mass of milk obtained was recorded. Using the density of milk (1.03 g/mL), a volume was determined and a flow rate (mL/min) was obtained. This was then repeated three times before an average was calculated and the device was changed. In order to prevent curdling of the milk affecting the flow, the milk was changed every 2 hours. Taking the results from the initial phase of the experiment, the devices were then tested using a Prismaflex CRRT machine (Baxter) using an HF20 circuit. Equine blood was used as a human blood substitute. Milk was not used due to the fat content, and the presence of multiple filters within the circuit. With a haematocrit similar to whole blood, animal blood is better than human packed red cells to mimic in vivo conditions. The eight intravenous access devices, a three-way tap and a 15 cm lectrocath (Vygon) line connector were each, in turn, connected to a standard HF20 CRRT circuit. Two of each device were used, one as the access and one as the returning limb. Both limbs were placed in to a 500 mL container of blood, at a height of 80 cm from the floor, to correspond with a typical bed height. Each device had access and return pressures measured at fixed flow rates of 20, 30, 40 and 50 mL/min and this was repeated three times. Before each run the blood was agitated to prevent it from settling. The machines have a pressure limit of −250 mm Hg in the access lead and +350 mm Hg in the return lead. When these limits are exceeding, the machine alarms and fails to run. In this case, no pressure value is displayed. In order to generate an average pressure reading over the three runs, approximated values of −260 and 360 mm Hg were used for any run that exceeded the operating limits of the machine. A total of eight devices and two combinations were tested. Results showed the flow rates increased with pressure, non-linearly, which was presumably due to the introduction of increased turbulent flow as flow rates increased (figure 1). Flow rates at particular pressures for eight devices tested: gravity system using whole milk. The study showed that the highest flow rates for intravascular access devices were achieved by the 8Fr and 6.5Fr haemodialysis catheters, giving flow rates of 128 and 101 mL/min respectively at 150 mm Hg (table 1). Both lumens of each device were initially tested; however, there was negligible difference between them. The three-way tap produced the highest flow rate of all devices with 168 mL/min at 150 mm Hg. Our clinically useful minimum flow rate of 30 mL/min was achieved at pressures over 100 mm Hg by the 8Fr haemodialysis catheter, 6.5Fr haemodialysis catheter, and the 18G and 20G cannulae. All other systems did not meet criteria. The needle-free valve was only tested in combination with the 20G cannula. Flow rates decreased by approximately 10% from values obtained when the 20G cannula was tested on its own. The blood had a measured haematocrit of 0.437. In total, eight devices and two connecting pieces were tested. The results obtained complement the results from the initial experiment, with an identical hierarchy of intravenous devices. The lowest access and return pressures at the four set flow rates were achieved by the 8Fr and 6.5Fr haemodialysis catheters (figure 2). The 20G and 18G cannulas were also able to maintain usefully low pressures at all four flow rates tested. Access and return pressures at particular flow rates for eight devices tested: continuous renal replacement therapy machine with HF20 filter using equine blood. 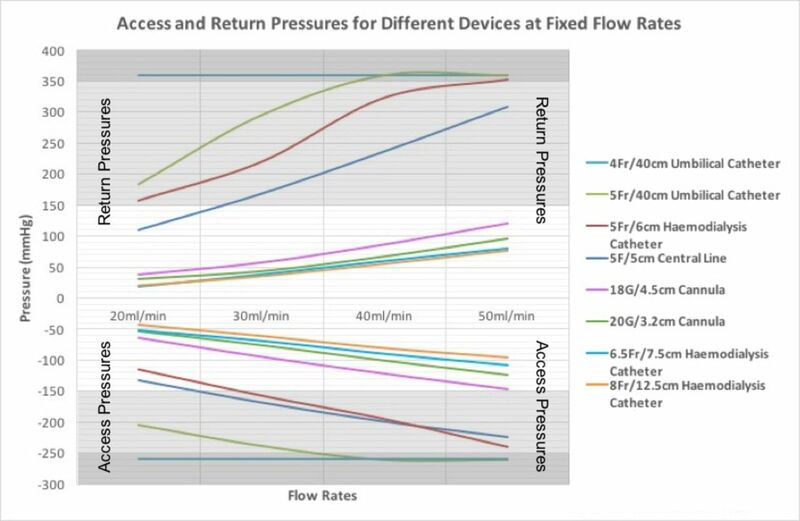 Pressures obtained for the remaining four devices, however, were significantly higher with the 4Fr umbilical catheter exceeding the machine's limits at all four of the flow rates in both the access and return leads. Similarly, the 5Fr umbilical line and 5Fr central line exceeded the pressure limits in both leads on multiple runs. An 18G cannula which had been folded over at the hub on one occasion only, and then straightened, needed 10% higher pressures than previously at the same flow rates. In both our experiments, the 8F and 6.5Fr haemodialysis catheters, the 18G and the 20G cannulae gave suitable pressures/flow rates for haemofiltration. The 5Fr central line, 5Fr haemodialysis catheter and 5Fr umbilical line all produced similar results, needing pressures of over 150 mm Hg for acceptable flows, which is too high for reliable functioning of a CRRT machine. As this project was conducted in vitro, we need to account for variability in the flow rates when used in vivo. Due to the narrow margin from the safe value, we would advise that none of the 5Fr devices would be acceptable in practical applications of CRRT. The 4Fr umbilical catheter did not produce sufficient flow rates at any pressure and therefore would not be suitable. Using cannulae would need ‘cross filtering’. The concept of ‘cross filtering’ is the separation of the access and the return limbs of the CRRT circuit. This has the benefit of reducing the risk of blood recirculation, and also has the added complication of needing two central veins as access instead of one. On its own, the three-way tap exhibited the highest flow rates of all. This is therefore not a limiting factor to flow and so can be introduced in to a system with any of the devices with negligible effect on flow rate. The needle-free valve however did effect the flow, causing approximately 10% decrease from the original flow rate value for the 20G cannula. The 15 cm lectrocath IV connector similarly obstructed flow, and is not suitable for haemofiltration systems.
) on our data. Using only the four single lumen lines (18G and 20G cannulae, and the 4Fr and 5Fr umbilical lines), as multiple lumen line lumens do not have circular internal cross-sectional profiles, we calculated the following theoretical flow ratios when compared with the highest flow single lumen line (table 2). 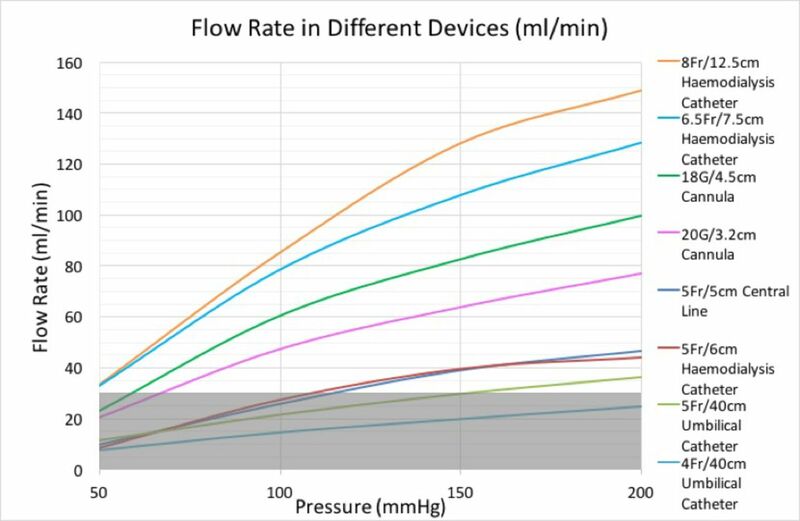 Theoretical flow ratios and pressures compared with 18G cannula. It can be seen that the actual flow rate is, for most of the pressures and lines tested, lower than the theoretical ratio. The Hagen-Poiseuille equation can therefore not be directly relied on in this real-world application. Intravascular access devices are rated by manufacturers for flow rates. This is calculated by a standard 1 m high (75 mm Hg) filling pressure of deionised water.5 Table 3 shows the stated flow rates, and the estimated pressure needed in our system to achieve such flows using milk, with its similar viscosity to blood. Of note only the 4Fr umbilical line achieved the manufacturer's stated flow rate. The 18G cannula only achieved 40% of the stated flow. We advise caution when applying such manufacturer's data to practical patient situations. The two phases of our experimentation gave an identical hierarchy of the usefulness of the devices. The Prismaflex CRRT machine measures access, transfilter and return pressures. Our gravity system is most equivalent to the return pressures, and there is good correlation between these numbers. As would be expected, access pressures are higher than return pressures, due to the collapsing effect of negative pressure on the circuit. Our study has shown that a minimum rate of 30 mL/min can be achieved, at low pressures, by using two separate 18 or 20G cannulae in substitution for the standard intravascular access normally used for CRRT delivery. However, it is important to note that by using cannulae, a different access point is required for input and output, as opposed to a single line required if standard CRRT equipment was to be used. This may be challenging, particularly in smaller children, and limits access sites for central drug admission or TPN feeds. This however may be overcome by the use of the three-way tap in the system allowing use of this line while CRRT is ongoing. Great care needs to be taken of the cannula tubes, so that the tube remains patent and does not become ovalised or damaged. In very small patients needing CRRT, where the use of a large haemodialysis catheter is impossible due to the patient size, we advise the use of two 18G cannulae in different sites, with the use of a three-way tap to increase drug administration flexibility. Although this is an off-label use of this device, for these patients there are no other options. In an in vitro system, this gave suitable flow rates, with some flexibility for in vivo variations. If the size of a patient allows, a haemodialysis catheter of at least 6.5Fr should be used. A needle-free valve or line connector should not be used.
. Continuous renal replacement therapy for critically ill infants and children. Dan Med J 2012;59:1–4. Vp-scientific.com. Viscosity Tables. 2016 http://www.vp-scientific.com/Viscosity_Tables.htm (accessed 19 Mar 2016). Sterile, Single-Use Intravenous Catheters. Part 3 Central Venous Catheters. New Delhi: Indian Standards, pp.1-13, 1996. https://law.resource.org/pub/in/bis/S09/is.iso.10555.3.1996.pdf. (accessed 12 Apr 2016). Contributors IS-H completed the experimental work and drafted the paper. DR advised on study design and edited the paper. PD conceived the study, advised on study design, edited the paper and is guarantor. Data sharing statement Source data is available on request from the corresponding author.